« It’s 11pm. Do You Know Who Your Bank Is? I had shoulder surgery a week ago and typing is really hard to do, so I am scarce online these days. My little bottle piglet Minnie (named after Minerva McGonagall) celebrated her first birthday this week. 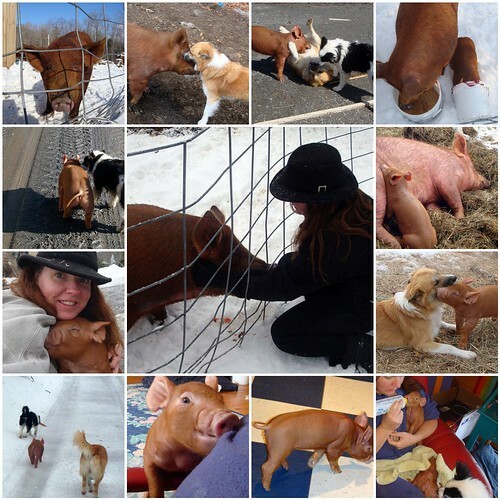 I put together a collage, just like I did for my pups. If you click on the image, all of the different shots that went into it are clickable. I’m so glad I ignored the advice of my vet and the farmers I spoke to and tried it anyway. They all call her my magical pig, because it is supposedly hard to get one to live. She should be bred now, and expecting piglets in about 6 weeks. Between her personality and Albus Dumbleboar, I have high hopes for the friendliest pigs on earth. She is a purebred Tamworth. I just got her corrected papers in the mail this week so she’s all official and everything. She’s super cute!!! Love all the play time pics!